VIP Commission…This is an Endurance Sport. 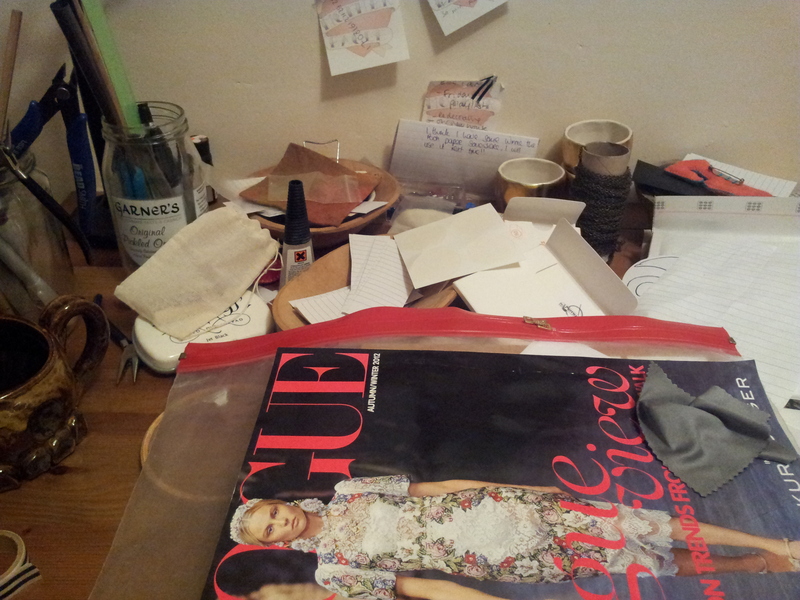 This is what my desk currently looks like. Tidying up, along with all other non-essential tasks, have ceased to work on the VIP Swans. It’s going well. Better than well, probably my best work. But I am a very bad embroiderer. My husband says it’s the ‘Mad Scientist’ in me. I literally sleep, dream, eat, breathe this piece. Well, I would if I actually ate (or drank) anything during a session of stitching. I’m bad. I get all intense and can’t leave my chair. 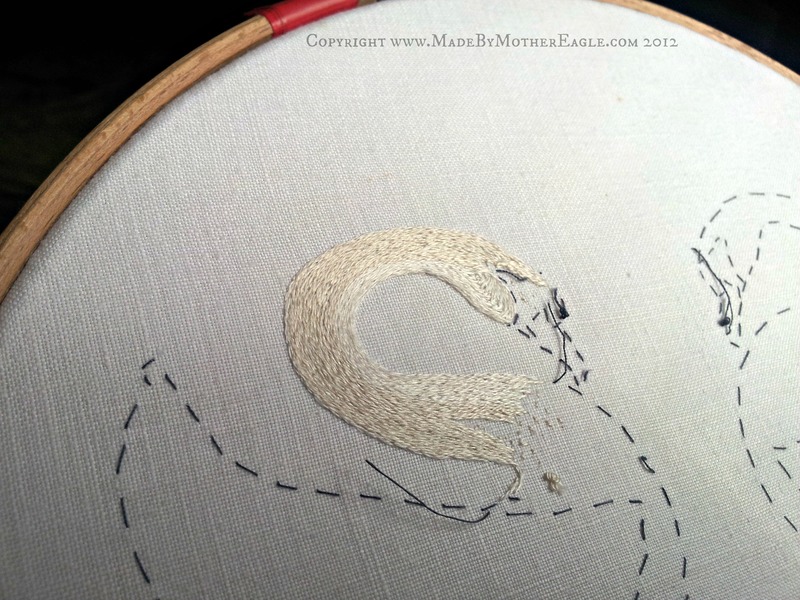 At night I obsessively think of the next bit and what stitches to use and how I will frame it…I torture myself. Like all my work-in-progress pics these ones are crappy, but so far I have just been doing heavy fill split stitch in single ply cotton. 4 shades of DMC so far. I pick out my tacking lines as I go. 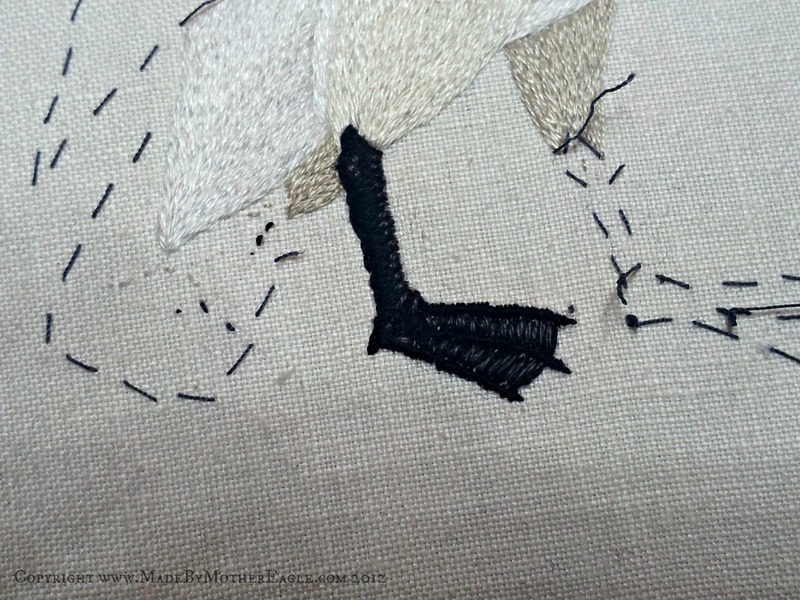 As I am laying my stitches I am building up a beautiful sheen; with all the curves of these swan’s bodies, it does look elegant. 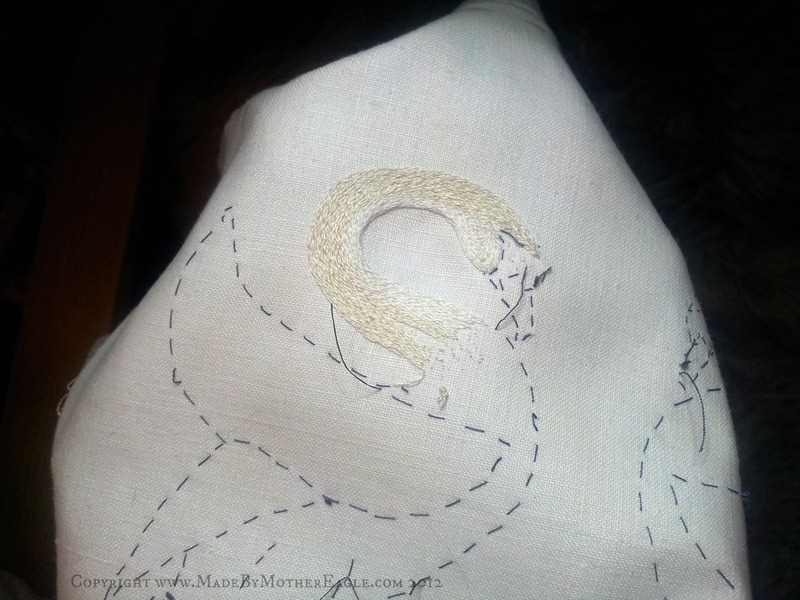 It won’t all be split stitch. I have plans for the wings and feathers. 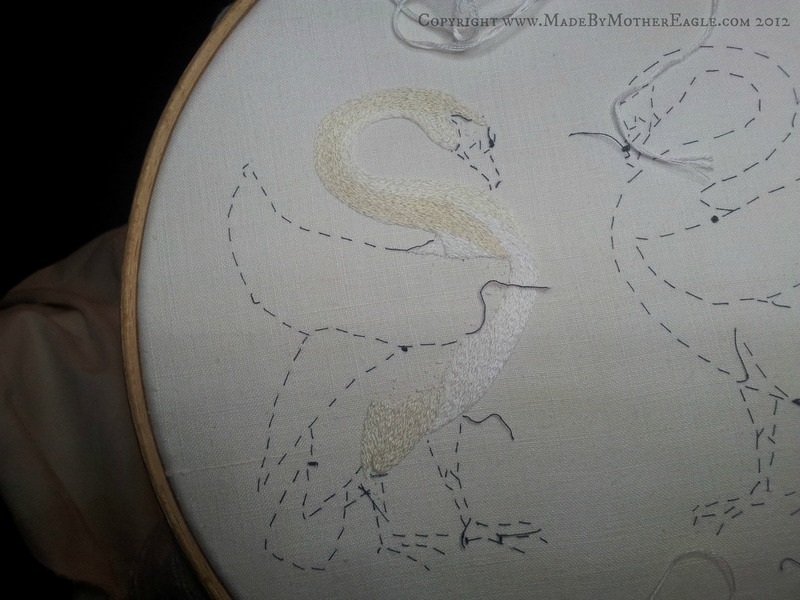 The thing that makes this so intense mentally for me I think is that I don’t plan my embroideries; believe it or not I make one decision about the first bit I do to get started then I make it up as I go along. This organic creativity gives birth to having a stylised banded colouring to the body, and the way I will ultimately do the wings. It means though that I am constantly making decisions and judgements as I work on anything new, which is mentally tiring. If I sound all ‘woe is me’ I’m not, honest. I love love love doing all this. I have a lot of in-my-head time while doing it though which gives rise to these kind of ramblings and insights. Here’s a foot! I satin stitched the leg, then split stitched the toes, and wrapped them with cotton to make them 3 dimensional. I’ve used grey over the top to give detail. It was fun using black after so much white on white. 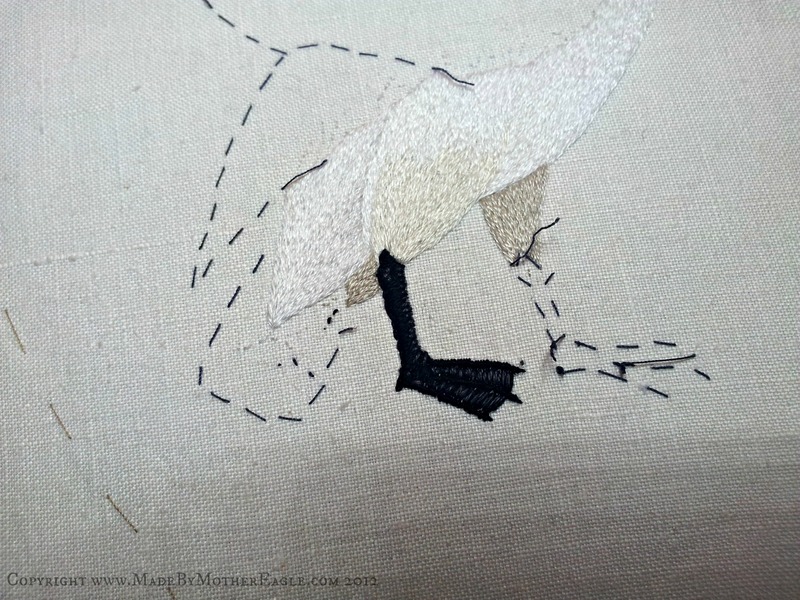 This weekend, I plan to finish this swan entirely, so I can race to complete his twin by my deadline! This looks great so far, I don’t think you give yourself enough credit.